Summer is fast approaching which means those with swimming pools, or, If you are thinking of investing in a pool, will be getting everything primed and ready for opening day. Opening your pool should be low stress and a much-anticipated event for everyone in the family. Let’s assume you did everything necessary to prepare your pool for winter, including protecting the pump; opening day should happen without setbacks. However, that is not necessarily the case every year. The heart of your pools circulation system is your pump which is why it is crucial that you have the best pool pump for the type of pool you have. The pump has the most important job of your pool equipment because if the pump is not working correctly or worse, not at all, nothing else is going to work either. Buying the best products and equipment can often lead to more stress than necessary to keep your pool in perfect operative shape. The reason for this is that there are so many different types, brands, and prices. In the guide, you will not only learn which pool pump is right for you, but you will also learn a bit more about the different types available. The wrap things up we will reveal which one we choose as the best in its category. Tip: When shopping for a pool pump, the two most important considerations will be: 1). The volume of energy the pump will consume while doing its job, and 2). The strength of the pump you will need to clean /and, or, heat your pool effectively. 2 When Should You Run the Pump? 3 How Long Do I Run my Pool Pump? 4 The following are the Top 10 Pool Pumps Available on the Market Today. As mentioned above, the pool pump is the heart of the circulation system of your pool. Its job is to pull water from the pool through the main drain and the skimmer. Then through the main returns, the pump pushes the water through the filter and returns it to the pool. The pump consists of three components: The impeller, lint, and hair trap, and of course, the motor. The pool motor is electric and uses either 220 or 100 volts and turns at 3,450 rpm. Because the motor is air-cooled, meaning there is exposure to the environment, you need to pay extra attention to excess water entering the motor. That excess water can enter via the cooling vents that are on the bottom of the housing. At the end of the motor shaft is where the impeller connects. When it turns, it circulates water through the lint and hair trap located at the end of the pump. It then forces the water out of the top of the pump via a pipe that leads to the filter. The impeller is where debris often finds its way in through its the small openings. More than likely if you notice the pressure of the gauge is reading lower than what it is supposed to be, the impeller is either damaged or clogged. You can take the impeller apart to determine which is the issue. Assembly is simple to do. The special lint and hair trap located at the end of the pump is there to prevent as much debris as possible from entering the impeller assembly. The inside of the trap is a basket. You need to check and clean it at least twice per week. That will cause the motor to turn faster and eventually it would burn out. If there were a not a basket at all, the impeller would clog with debris and prevent large amounts of water from flowing, or it would be damaged altogether. Tip: The performance of the pump is what will decide the complete operation of your pool. In general, the cleaning system cannot function without the main pump, and the pools filtering system is useless with the main pump operating. Therefore, it is vital to stay on top of proper scheduling for the operations of the main pump. When Should You Run the Pump? Two factors determine when you should operate the pump. Energy cost and chemical demand: Being the sun’s ultraviolet light removes the chlorine from the water, the highest demand for chlorine is during the daytime. 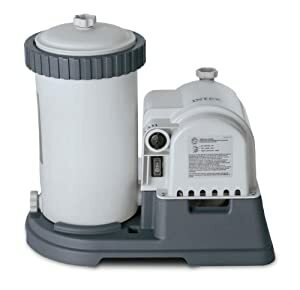 While most methods of adding chlorine require the pump to be running to furnish the proper amount, it is best to run the pump during the daytime hours rather than nighttime. However, there is a catch. Electricity costs more during daytime hours. Therefore, you must weigh these two factors to determine which schedule best suits the need of the pool and the owner. The best case scenario is to operate the pump from sunrise to sunset. That schedule would best suit the pool owner whose electricity cost does not fluctuate throughout the day. To run the pump at night is another scenario to avoid high utility costs. You should note that the amount of chlorine you add to the pool must remain enough that the level stays at or above 3.0ppm throughout the daylight hours. That is especially true for the afternoon. How Long Do I Run my Pool Pump? Just like above for when you should use your pool pump, for how long during each cycle depends on two main factors as well: filtration and chemical demand. Throughout the summer months, the chemical demand of your pool is at its peak. Generally, the bathing load during this time is higher; there will be increased amounts of debris as well. That means the requirement for filtering more thoroughly to remove excess debris is higher at this time as well. The rule-of-thumb to determine each pumping cycle length is for every 10° F of the outside air; you should run the pools pump for 1 ½ hours. For example, if the temperature where your pool is was 100° on average, then your pump needs to operate for at least five hours each day for that month. You should follow this rule conservatively beings there is no precise prediction of temperature every month. During the winter months, pool professionals recommend that you run the pump four to five hours each day. For the hottest months of the summer, the recommendation is 12 hours per day. Moreover, for spring and fall, it will depend on the temperatures of your region. Tip: You can divide daily cycles into multiple cycles, but each one should be no shorter than four hours. The reason is that is the minimum time it takes for all the water to pass through the filter at least once. Moreover, it is the recommended time between adding chemicals and the next pool use or water test . With this information, you can see why it is vital that you buy the best pool pump for your swimming pool. You need one that can last through running hard and at times long periods during the busy hot summer months. Like the other products and equipment for the inground pool and above ground, you can easily get discouraged finding what is best for your pool. You also want quality as well as durability and to get the most for your money. How can this be accomplished with some many on the market today? In this buyers guide, I hope to put all your worries aside and help lead you to the exact pool pump you need. You will know which is the best to invest your time and money to get your pool up and running this summer. 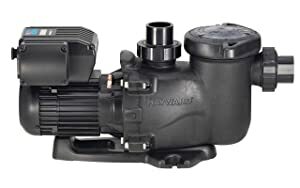 The following are the Top 10 Pool Pumps Available on the Market Today. When it comes to swimming merchandise, Intex is a name everyone knows and trust. 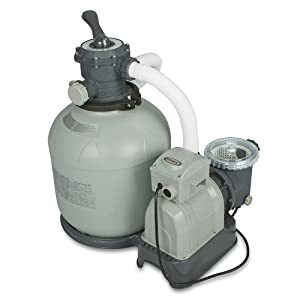 With this Intext Krystal Clear Sand Filter Pump, you can keep the water in your pool clean and safe. One of the most popular strategies to keep water in pools today is via sand filters. These type often pick up a more significant amount of dirt particles and algae that float in the water of your pool. Moreover, not only is it effective, it will save time and cost since the sand requires replacing only once every five years. That is a huge money saver, unlike the ones that need replacement every two weeks such as a filter cartridge pump. Sand filter pumps such as the Intex 3000 are the lowest maintenance and most efficient filter pump option for your above-ground pool. With the Intext Krystal Clear, you will have no trouble keeping your pool water soft, clean, and refreshing. The pump has a 24-hour built-in timer that adds to the “no-hassle” experience of maintaining and keeping your pool clean. The lint and hair basket offer easy-cleaning and adds to the life of the sand. This Intex pump produces a pump flow rate of 3,000 gals. Per hour. That makes it the ideal choice for your above-the-ground pools that are 16’ and above. There is typically no maintenance other than the sand that you only must replace every five years. The Hayward Super Pump is a technologically advance pump that blends cost-effectiveness with durable construction. Hayward set the standard for value and excellence with this product. The pump’s design is for all sizes and types of inground pool and spas. The Super Pump’s impeller features higher flow rate with using less horsepower than other pumps on the market. That means you can save on electricity while running your pool pump less. The Hayward comes with a 100 cubic inch basket for extra leaf-holding room which extends the in-between time cleanings. For heavy debris loads, its rigid construction and load extender ribbing guarantee free-flowing operation. Hayward makes it simple and easy to remove the strainer thanks to its swing-aside hand knobs. Thanks to its durability and design, the Pentair IntelliFlo saves you up to 90 percent on operational cost versus traditional pumps. It continues to receive high ratings due to its exclusive quieter operation ability and has built-in diagnostics that protect the pump and provides you with extended service life. The built-in timer and eight programmable settings provide optimum run-times and speed for savings through maximum efficiency. You will reap all the benefits for years when you invest in the superior engineering of the IntelliFlo Pump. Any time you are in the market for a pool pump you want to buy the best for the money, right? With Hayward, you can never go wrong. 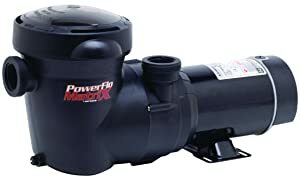 The Hayward PowerFlo Matrix design is a uniquely exceptional pool pump for above ground swimming pools. Its integrated style and large profile make the pool pump unlike any other. Its industrial size basket for straining collects large debris while needing minimal maintenance. Its high-performing, heavy-duty motor has an integrated automatic thermal overload protector providing you with many years of operation. It comes with an impeller that is high performing and prevents debris and leaves from clogging the motor. With the press of a single button, you can convert from vertical to horizontal discharge orientation with ease. One of the best features of the Pentair SuperFlo VS Variable Speed Pool Pump is how quiet it runs. Stocked with an ultra-quiet TEFC motor, you will appreciate it easy-on-the-ears designs that eliminate the high-pitched unpleasant sound of most pool motors. The Pentair pumps design is one of the only pumps that have a real-time, 24-hour clock, along with an advanced on board digital display. This feature makes it simple to program and monitor. The SuperFlo VS pump is also the only variable speed replacement pump available to does not require any expensive rewiring. That is due to it running on either 230 or 115-volt power. 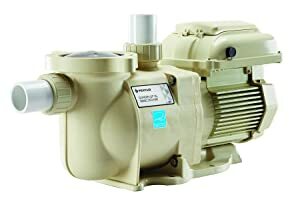 The pump has an easy-access wiring compartment making connection fast and straightforward. It has variable speed technology that significantly cost less to operate. The Pentair SuperFlo has three operating speeds plus override capability. Here is another high-quality product from Intex. This Intex Krystal Clear Cartridge Filter Pump for Above Pools ensures that the water in your pool stays refreshing and Krystal Clear all summer long thanks to it 2,500 GPH Filter Cartridge Pump. 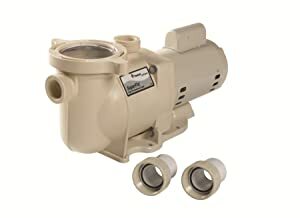 This filter pump specifically made for above ground pools has an easy installation where all that is necessary if attaching hoses that plug right in with little assembly required. The pump is unlike others, in that it comes insulated, and has an auto-timer that you can pre-set 2 to 12-hour cycles. For trapped air inside the filter chamber, the Intex has a built-in air release. It also has a sediment flush valve and comes with one Hydro Areation Technology inlet fitting. With the Intex, you will get one replaceable filter cartridge that is simple to clean. This product will work with 18’ Metal Frame, 18’ Easy Set, or 18’x10’ Oval Frame Pools. When you have the Hayward Max-Flo VS Variable Speed Pool Pump, you have an industry leader in energy-efficient at any speed pool pump. This Hayward product comes with an extra-large, no-rib basket designed to guarantee debris and leaf removal while extending times between cleanings. It has a built-in time-clock that makes programming easier when compared to the basic countdown timers. Moreover, you get a permanent magnet, TEFC –(totally enclosed fan cooled) motor that provides incredible reliability and efficiency. One favored feature is its incredibly quiet operation. It has a MaxFlo Vs.’ variable speed control that guarantees that the water flow Is at the rate you need. 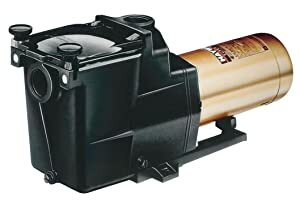 The Wayne Water Removal Pool Cover Pump is what you call an automatic on/off water removal pool cover pump. It has a maximum flow rate of 3,000 gallons per hours via a 1 ¼ “drain hose. It comes with a check-valve with a ¾” garden hose adapter for reducing repetitive cycle. Also, there is a 25’ power cord; a 25’ “pull to shore” rope to assist with positioning the pump on the pool cover. 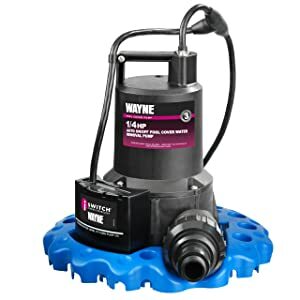 When you wake up to having much debris and water on the cover of your pool, you will be glad you have the Wayne Automatic Water Removal pump. There is no better solution to debris and water buildup than this Wayne’s product. It has automatic freeze protection that aids in protecting the pump from damage. There is also a strainer base for filtering debris to prevent clogging and to keep the pump from turning over. 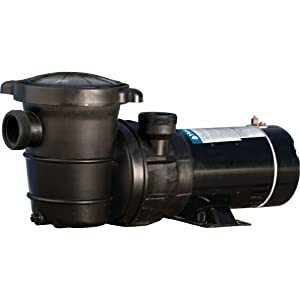 When it comes to meeting all the essential principals of an excellent spa, pool, or feature of a water pump, the Pentair SuperFlo Single Speed Pool Pump has it handled. This Pentair product is super quiet, incredibly easy to maintain and energy efficient to the max. Moreover, its design is of innovative materials that can handle the most challenging and demanding conditions and installations. SuperFlo is a leader in single speed pool pumps. It does not matter if you are in need of your first pool pump or replacing an older model, you will have the superior technology on your team when adding the Pentair to your pool equipment. The SuperFlo has advanced features such as thick-walled parts of the body, a 56 square flanged heavy-duty motor, and engineered hydraulics that is highly sophisticated. The Pentair comes with a strainer that is abundance in size to offer extended time between cleanings. It also has a see-through lid that provides fast and easy inspections. The Single Speed pool pump has self-priming for quick, easy startup and comes with a one year warranty. This Harris ProForce Above Ground Pool Pump is not as expensive as the well-known brands, but do not underestimate its power and performance. With the product, you will be surprised at its durability and outstanding results. The ProForce design is of corrosion-proof, heavy-duty construction. It also comes with a stainless steel motor casing made of a reinforced thermoplastic body for more extended durability and life. The engineering is advanced so that it can provide you with minimal noise but high-efficiency performance. The ProForce strainer has a large filter basket that is simple to clean with a see-thru, twist and lock lid that allows for a clear view for quick emptying. This pump is not approved for portable pools but meets, or exceed all ETL and CSA requirements. There is always a product in every industry that stands out from the crowd. Whichever pump you choose from this list you can rest assured you are getting a high-quality product. Different consumers have different pump requirements which are why we did the hard work for you to help you choose. The following products are the ones we choose as our pick. Much thought and research went into this decision because we take what we do seriously, and we only pick the best for our readers. 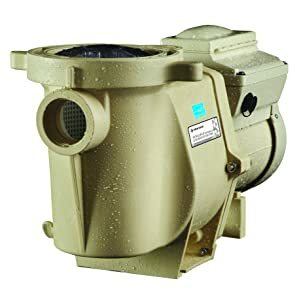 For Pool Filter Pump, our pick is the Intex Krystal Clear Sand Filter Pump for Above Ground Pools as the leader in its class. Our pick for a Single-Speed Pool Pump is the Hayward SP2607X10 Super Pump 1 HP Pool Pump. Having a pool during the hot summer months is a luxury within itself. You want your pool to always be ready for when you want to dive in and cool off. That is why it is a necessity to have the best pool pump whether it be for an inground pool or above ground. Through this buyers guide, you can be confident to choose the right one. We want you to have a great summer relaxing in your pool. That is why the products we review are leaders in the industry. You should not have to worry about whether the pool pump you choose is good for the money, with us, we take the guessing out.